This 10,550-square-foot alternative high school will exist at the site of a former elementary school. The non-traditional classroom will host an innovative teaching program based on project-based, student-driven subjects. Study is self-directed based on the students’ interest and the learning spaces are designed to engage students and allow them the opportunity to set their own course of study. 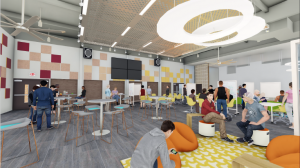 This project includes demolition of interior spaces in three classroom buildings and two sets of restrooms, and reconstruction of finishes in those spaces. Exterior site modifications include demolition of out-of-tolerance concrete walkways, bringing these into current ADA compliance, constructing a new entrance courtyard with seat walls, the placement of decorative boulders for outdoor learning, and new landscaping along street frontages. This is a fast-track project with a strict budget that will be completed during the summer months while school is out of session. The first SJUSD Unschool students will attend in August 2017.